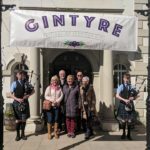 A Kintyre spirit was uncorked as best newcomer at the second annual Scottish Gin Awards. 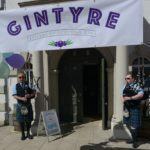 Last Thursday Beinn an Turic distiller Niall Macalister Hall was on ‘cloud nine’ after Kintyre Gin scooped the award and narrowly missed out on the Excellence in Branding Award. Mr Macalister Hall’s brother Kenny, who is responsible for the branding and his wife Emili Fusaro were feted at the star studded ceremony, attended by 600 people, featuring Loose Women’s Kaye Adams and comedian Des Clarke. 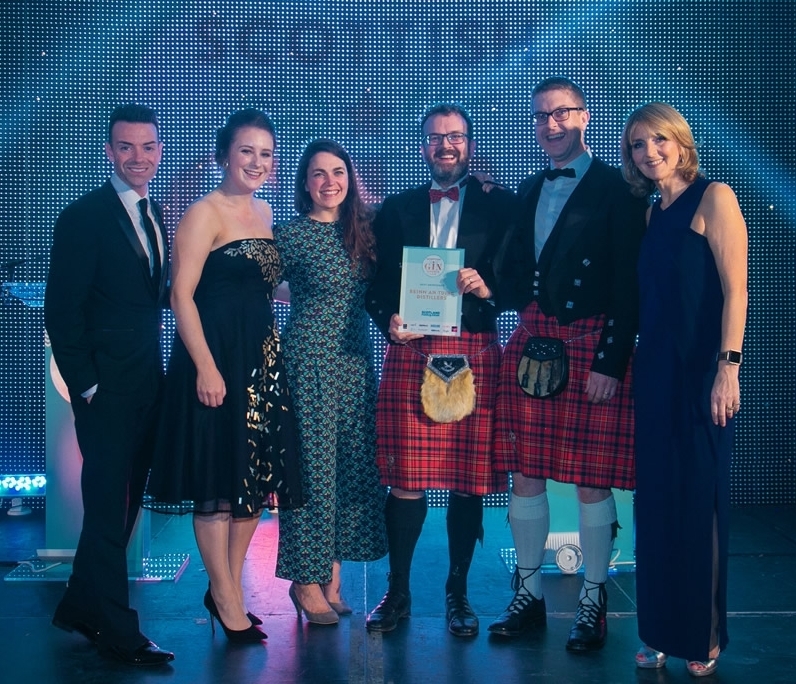 ‘We were utterly delighted to be announced as the winners in the Best Newcomer Category,’ said Emma Macalister Hall, ‘We were nominated in two categories – Best Newcomer and the Excellence in Branding Award which was announced first. 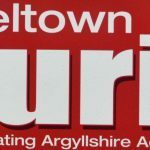 ‘Sadly we missed out which was a bit of a blow as we have had such brilliant feedback about our branding. ‘Offshoot Design who came up with it have done a consistently brilliant job. ‘That’s the way it goes sometimes though! Well done to the Electric Spirit Company who scooped the prize. ‘A few announcements later and it was time for the Best Newcomer award. The Newcomers Award was a busy category, with eight businesses altogether and as the first announcement was for the highly commended firm. This went to Crafty Distillers who make Hills and Harbour Gin. Mr Macalister Hall said: ‘With all still to play for, nerves were palpable but the trauma was over when compare Des Clark read out Beinn an Tuirc Distillers as the winner. ‘Shrieks of joy ensued and we trouped up to the stage to accept the award. The awards were selected by experts with a wide range of distilling experience and included: Alex Bruce the judging panel chairman and director of Adelphi Distillery; Annie Hill associate professor at Heriot-Watt University’s International Centre for Brewing and Distilling and Alan Wolstenholme the chairman of the Scottish Craft Distillers Association. Mr Macalister Hall added: ‘What a fabulous night. We are over the moon to be recognised as quality producers in the Scottish gin industry.